Every tenth day a language disappears, and at that rate, within a few generations, half of the approximately 6000 languages in the world today will be extinct. That a language can die is a complex subject. Is a forgotten language the same as a dead one? Can language be kept and conserved for future generations, or is a language alive only when actively used and spoken between people in a society? What we lose when a language dies is a broad topic which is interesting from both a cultural historical, linguistic and philosophical point of view. With a background in art, music and philosophy, Espen Sommer Eide has used numerous approaches to observe the phenomenon. He is interested in the complexity in the process behind destruction, evolution and creation of language. The archiving of language can function both as a destructive and creative process. One of the works in the exhibition orbits around how linguistic structures are stored in a collective conscience, and how the voice in some instances can revoke the destructive powers of time and memory. The sacred Indian Veda texts have been passed through generations since approximately 1800 BC. Despite that the texts were passed on orally, the contents has been conserved verbatim due to the special way the texts are recited in complex paralinguistic patterns. In the exhibition this subject is also treated from a pure aesthetic perspective. Is it possible to find a unique signature of sound in different languages, and can such an aesthetic aspect be detached from the aspects of knowledge and identity? What is the sound of dead languages, and can it be revived? When Edison invented the phonograph, it was soon seen as a means, not primarily to play music, but to hear voices of dead persons. The voices recorded on the phonograph were experienced as sounds without bodies; as spirits in space. Through deconstructions of language Sommer Eide touches questions about the lines between living and dead languages, between meaning and sound, and between linguistic metaphorical structures and musically structured sound. In the exhibition he shows among other things his self-produced musical instruments, historical archive material new sound- and video-works. In addition to the exhibition, the project consists of a series of performances centred around self-made musical instruments (‘philosophical instruments’). Here the material is given ‘new life’ as direct interaction between the artist himself and other specially invited artists. ‘Dead Language Poetry’ is Espen Sommer Eide’s first solo exhibition. The exhibition is curated and produced by Bergen Kunsthall, and is part of an annual cooperation between Borealis and Bergen Kunsthall. Espen Sommer Eide (b. 1972) is an artist and musician living in Bergen, Norway. With his solo project “Phonophani” and as one half of the band Alog he has released many albums on Rune Grammofon record company and he has done extensive touring both home and abroad. In addition to have developed many custom made musical instruments, Eide has participated on many exhibitions and projects at, among others, Henie-Onstad Art Centre (Oslo), Stedelijk (Amsterdam), Manifesta 7 and Barents Spektakel. As a part of the Verdensteateret (The world’s theatre) he contributes with making instruments, music and sound-design for works that have been seen in the Shanghai biennale, The Exit festival (Paris) among others. In the last years he has also been involved in several projects in the Barents region including a permanent decoration for the Skoltesamisk (Skolt sapmi) museum in Neiden, with focus on dying languages. Espen Sommer Eide (f. 1972) er kunstner og musiker. Han komponerer sine solo-verk under navnet “Phonophani”, og er en halvdel av bandet “Alog”. Han har utgitt en rekke sentrale utgivelser på plateselskapet Rune Grammofon. I tillegg til utstrakt turnévirksomhet i inn- og utland har Eide også stått bak en rekke kunstverk og installasjoner. I 2005 komponerte og fremførte han musikk for 50års jubiléet til Le Corbusiers kapell i Ronchamp, Frankrike. I 2007 komponerte han og fremførte åpningsmusikken til Nordlysfestivalen i Tromsø, samt stilte ut lydinstallasjonen “Sonus barentsicus”. I 2008 deltok han med performancen: “Building Instruments” på Manifesta biennalen i Italia og stilte ut kunstverket “Karusell” på Henie-Onstad senterets lydkunstutstilling. I 2011 deltok han på Stedelijk Museum Amsterdams prosjekt “Hear it!”, med performance/installasjonen “the Ligetizer”. I 2013 stilte han ut sin solo utstilling “Dead Language Poetry” på Bergen Kunsthall / NO. 5, og i 2015 solo-utstillingen (i samarbeid med Kristin Tårnesvik) “Korsmos Ugressarkiv” bl.a. på Nikolai Kunsthal i København. Eide var også initiativtager og festivalsjef for den elektroniske musikkfestivalen Trollofonen i Bergen. De siste årene har han også vært involvert i en rekke prosjekter i Barents-regionen og grenseområdene mellom Norge og Russland, deriblant permanente utsmykninger for Skoltesamisk museum i Neiden (“Language Memory”) og ved Univeristetet i Tromsø (Material Vision – Silent Reading), Dark Ecology (Sonic Acts), og Rural Reading Room, en serie hendelser i Sør-Varanger. Eide er også medlem i teater-kollektivet Verdensteatret, hvor han bidrar med bl.a. instrumentbygging, musikk og lyddesign for verk som har blitt vist på bl.a. Shanghai biennalen, Exit festival Paris, BAM New York m.fl. Hva som går tapt når et språk dør er en mangfoldig problemstilling som er interessant både fra et kulturhistorisk, lingvistisk og språkfilosofisk perspektiv. Med bakgrunn fra kunst, musikk og filosofi har Espen Sommer Eide brukt forskjellige tilnærmingsmåter for å se på fenomenet. Han er interessert i nettopp kompleksiteten i prosessene bak destruksjon, evolusjon og kreasjon av språk. Arkivering av språk kan fungere både som en destruktiv og kreativ prosess. Et av verkene i utstillingen kretser rundt hvordan språklige strukturer lagres i en kollektiv bevissthet, og hvordan stemmen i visse tilfeller kan oppheve tidens og minnets destruktive kraft. De hellige indiske Veda tekstene har blitt formidlet gjennom generasjoner (fra 1800 år fvt). Til tross for utelukkende muntlig overlevering er likevel innholdet bevart ordrett på grunn av den spesielle måten de resiteres på i komplekse paralingvistiske mønstre. I utstillingen behandles tematikken også fra et rent estetisk ståsted. Finnes det for eksempel et unikt lydlig avtrykk nedfelt i alle språk, og kan et slikt estetisk aspekt løsrives fra kunnskaps- og identitetsaspektene? Hvordan er lyden av døde språk, og kan det døde gjenopplives? Da Edison oppfant den første opptaksmaskinen for lyd – fonografen, ble den raskt sett på som et middel, ikke primært til å gjengi musikk, men til å høre stemmer fra døde mennesker. Stemmene fra fonografen ble opplevd som lyder uten kropp, som ånder i rommet. Gjennom dekonstruksjoner av språket og stemmen berører Sommer Eide spørsmål som omhandler grenseoppgangene mellom levende og døde språk, mellom mening og lyd, og mellom språklig-metaforiske strukturer og musikalsk organisering av lyd. I utstillingen viser han blant annet egenproduserte musikkinstrumenter, historisk arkivmateriale og nye lyd- og filmarbeider. Espen Sommer Eide (b.1972) is a musician and artist from Tromsø, currently based in Bergen. With the projects Alog and Phonophani he is among the most prominent representatives of experimental electronic music from Norway, with a string of releases on the label Rune Grammofon. He has also produced a series of site-specific pieces and artworks. These projects include a multichannel composition for the 50-year anniversary of the completion of the chapel of Notre Dame du Haut in Ronchamp, France, and a special ‘Building Instruments’ performance at the 2008 Manifesta Biennial. He has had solo exhibitions Dead Language Poetry at Bergen Kunsthall 2013 and The Weed Archive at Nikolaj Kunsthal 2015. Eide has also been involved in a series of art projects associated with topics relating to the Barents and Arctic regions of Northern Norway and Russia, including commissions for the Neiden museum (‘Language Memory’) and the University of Tromsø (‘Material Vision – Silent Reading’), Dark Ecology (Sonic Acts) and the ongoing experiments of the ‘Rural Reading Room’ events in the area. Espen Sommer Eide (Tromsø, 1972) is a musician and artist currently living in Bergen. He composes under the alias Phonophani, and as a member of the band Alog. Live he uses elaborate setups of custom made instruments, hybrids combining electronic and acoustic elements. He has several releases on the record label Rune Grammofon. Alog’s album Miniatures was awarded the Norwegian Grammy-award (Spellemannprisen) in 2006. In addition to touring extensively with his musical projects, Eide also has produced a series of site-specific pieces and artworks. These projects include composing and performing music for the 50-year anniversary of Le Corbusier’s chapel in Ronchamp, France, building the sound art installation Sonus Barentsicus for the Northern Lights Festival in Tromsø, Norway 2007, and a special performance at the Manifesta7 biennale in Italy, where local vinyl records were reconstructed into new musical instruments. 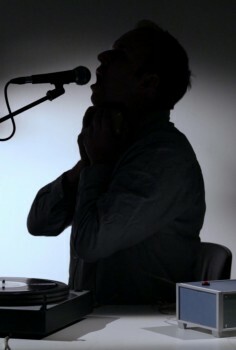 Eide is currently a member of the theatre-collective Verdensteatret, involved especially with building instruments, composing music and sounddesign. Verdensteatret’s latest show travelled extensively visiting amongst others the Shanghai biennale 2010. Eide has also been involved in a series of net-art projects with various topics connected to the Barents and arctic regions of Northern Norway, under the heading of “rural readers”. Amongst others a permanent installation for the Eastern Sami Museum in Neiden, Norway. In addition to making music and art, Eide has also been directing the Trollofon electronic music festival in Bergen (2001-2006), and worked as artistic developer at BEK (Bergen Center of Electronic Arts).